High school can be stressful. 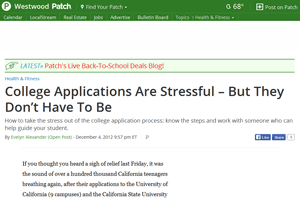 Parents, you feel the stress too, especially when your high school aged child is applying to college. The college search and college application processes are some of the most stressful times in a student’s academic life. Are you afraid you won’t survive the college application process? Let’s face it: looking at pretty college brochures or visiting colleges could be the fun (if not expensive) parts of applying to college. Actually filling out college applications? Not so much! Most students would rather do anything else than write their college essays, gather transcripts, and send test scores. How you can avoid this stress for both you and your child? The Westwood/Century City Patch asked for my advice on how students and their parents can manage the stress of applying to college. I shared how to make the college application process easy, including WHEN to start applying to college. Read this article to learn how you can reduce the stress and survive the college application process. If you thought you heard a sigh of relief last Friday, it was the sound of over a hundred thousand California teenagers breathing again, after their applications to the University of California (9 campuses) and the California State University (23 campuses) systems were submitted. The pent-up stress could finally be released: the deadline for applications to all campuses at both the UC and CSU was last Friday at midnight, and USC’s deadline was Saturday. And most students waited until the very last day to submit them.